Cooking schools in Italy are the perfect way of learning to cook great food while at the same time discovering and enjoying the regional culture and cuisine. We run cooking schools in Italy from the "Cantina" of beautiful Casa Ombuto or Torre del Tartufo, both stunning villas. We have one week or three day courses in one of our luxurious Tuscan Villas. You will learn to cook delicious Italian dishes in a relaxed and friendlyenvironment. Our cooking schools in Italy are taught by native Italian chefs who give the lessons in English and when they do not know the word they use their hands in true Italian fashion! Our chefs believe that the only way to learn is to do it yourself so be prepared to roll up your sleeves and get to work. The full week comprehensive course is designed to teach you to make splendid 4 course Italian dinners covering all the basic Italian cooking techniques, from pasta to pastries and everything in between. The three day cooking schools in Italy course offer two intensive lessons plus a full day culinary excursion and arrival day is on a Monday and departure day is on Thursdays. We grow our own organic vegetables or buy from local farmers so you will be working with fresh fruit and vegetables in season. Throughout your time at our cooking schools in Italy you will learn about the ingredients and the traditions around the dishes as well as food presentation and wine choice. You might also be interested in a Mediterranean Cookery Course that we teach at our cooking schools in Italy. This course focuses on the kitchens around the Mediterranean with an emphasis on great taste and variety. The cooking schools in Italy run from Saturday to Saturday if you are staying at Casa Ombuto and from Sunday to Sunday if you choose Torre del Tartufo. A one-day excursion will be organized to visit a vineyard for wine tasting, as well as to a local producer of olive oil and a visit to an authentic goat cheese farm. It is also possible to bring along a non-participating partner to our cooking schools in Italy, and they can spend their days sightseeing, or relaxing and enjoying the facilities of the villa before rejoining the party for the evening meals. If you are looking for cooking schools in Italy that will inspire you to learn to cook wonderful authentic Italian or Mediterranean dishes then we wouldbe happy to welcome you at Tuscookany - Cooking vacations at Casa Ombuto and Torre del Tartufo. 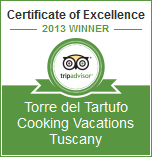 Find out more about our cooking schools in Italy here.